"Dad says he'll do it,' my mother tells me. My hand is suddenly sweaty as I press the phone against my ear. Two days earlier, I'd called my mother to ask if she would relay a request to my father. I'd decided that would be the best way to gauge his reaction without actually having to deal with him directly. I wanted to know if he would be okay with me calling him every day for thirty days to ask him about his experiences during the Vietnam War for a writing project. I had been writing about my life for years to work through some emotional issues, leaving out anything related to my father or to Vietnam. Those subjects were too painful, and I was too afraid of what would happen if I opened that Pandora's box. But as much as I wrote—about my botched marriage, the emotional turmoil I felt, and my failed quest to find contentment—I remained stuck. Blocked in both my writing and my life. Then one day a guest speaker at a writing workshop posed a question that hit me right between the eyes: 'What if you wrote about the thing you fear the most?' He said that he'd been trying to find happiness for years but nothing had made him happy until he started to explore and work through his fears. Although he would never have expected it starting out, doing that was the way he'd finally become happy. Frightening as it was, the idea also intrigued me. Could the key to finding happiness really be so simple? Nothing else I'd done had made me feel fulfilled, and I was tired of being miserable. I was willing to try just about anything. 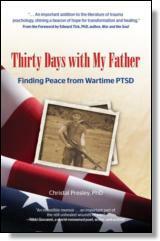 I knew exactly what I feared the most: my father and the war he had brought home with him from Vietnam. But that was the last thing I wanted to write about. I'd spent the last thirteen years of my life trying to put Vietnam behind me, and I'd gotten pretty good at pretending to be happy. But on some level I must have known that I wouldn't ever be truly happy until I addressed all the unspoken questions and issues with my father that I'd been trying so hard to ignore. Until then, I'd be stuck—not only in my writing, but in my life. When I asked my mother to ask him, I thought I was finally strong enough to go through with it and hear whatever he had to say. But when he agreed, I realized that my initial bravado had been resting precariously on my deep-down certainty that my father would never say yes. He wasn't supposed to say yes. Although I hadn't been consciously aware of it when I made the call to my mother, I must have subconsciously believed that when he refused I'd be able to tell myself I'd tried and go right on being angry with him as I had for as long as I could remember. But he said yes. Now what? Too late to back out now. I'd just have to figure it out along the way. The following morning I decided to go back into therapy for the first time in two years—just for a month, in case I needed some support to get me through the next thirty days. I thought I'd been doing very well. But what if the plan I'd come up with to move me forward actually wound up setting me back? I didn't want that to happen. I needed to stay strong. The therapist I found, Dr. Louise James, was older than I expected, old enough to be my mother. As she read through the lengthy questionnaire I had just completed, I sat across from her, silently counting the framed photographs adorning the walls and then the potted plants scattered about the office. I've always hated the first appointment with a new therapist, and there have been many. By the time I went to see Dr. James, I was highly skilled at sizing them up. I could tell right away if someone would be able to help me. Or if it was someone whom I wanted to help me. I liked Dr. James. Her voice was kind, and she didn't try to impress me with her qualifications. As ridiculous as it now sounds even to me, I remember clearly the first thing I said when I walked through the door of her tidy, homey office: 'I've had more therapists than I can remember. I'm not here to begin therapy again. I only need you for thirty days because I'm doing this project with my dad. Once a week for thirty days; that's all I need.' That's how I thought of it—as a project. Like a school assignment I'd complete, hand in, then file it away and be done. Dr. James wrote down everything I said without ever taking her eyes off mine. She didn't even glance at her paper. You have to admire talent like that. I kept assuring her that wouldn't be a problem. It was only November. My thirty-day plan meant I'd be out of there before Christmas. Finally she just shrugged. Her questions stung. I knew that my relationship with my father was broken, but hearing those words spoken aloud somehow made it seem that much worse. I nodded. I took a deep breath. 'Yes,' I replied. 'When was he diagnosed?' she wanted to know. 'What are your parents' names?' Dr. James asked. I looked down. 'Delmer and Judy Presley,' I said tentatively, not quite sure why she needed to know this. Did I feel angry right now? I didn't know. I thought I was past that. Did I sound angry? I handed Dr. James my co-pay and closed the door behind me. My mind was already churning. I'd agreed to keep the journal, but where would I start? It had been twenty-six years since I first realized something about my family was horribly, terribly wrong. Twenty-six years that I'd been hiding from my father. I was barely out of the building when I was surprised by the words that suddenly flashed through my mind: Dear world, I would write. You missed it. I was dying back then, I couldn't tell you, and you goddamn missed it. . . .
©2012. Christal Presley, PhD. All rights reserved. Reprinted from Thirty Days with My Father. No part of this publication may be reproduced, stored in a retrieval system or transmitted in any form or by any means, without the written permission of the publisher. Publisher: Health Communications, Inc., 3201 SW 15th Street, Deerfield Beach, FL 33442. Christal Presley, PhD, is the founder of United Children of Veterans (www.unitedchildrenofveterans.com), a website that provides resources about Post Traumatic Stress Disorder (PTSD) in children of war veterans. She obtained her PhD in Education in 2009, and is an instructional mentor teacher in Atlanta Public Schools. This is her first book.